On this week’s episode I am joined via the Skype machine with Tim Hall, The People’s Critic! 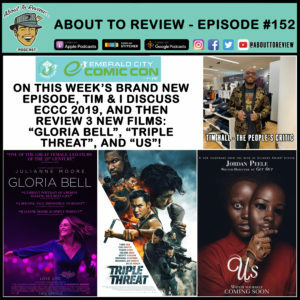 We start the show talking about Emerald City Comic Con 2019, and then review the films “Triple Threat”, “Gloria Bell”, and “US”. Check it out! 48m:30s – 52m:10s: Discussion, review, and rating of “Gloria Bell” (IMDB.com/GloriaBell). To listen to me go more in depth, check out the episode of “Cinema Squabble” I was on a couple weeks ago.